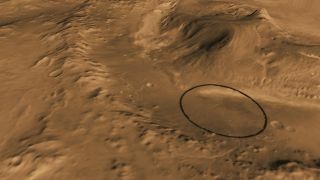 This computer-generated view based on multiple orbital observations shows Mars' Gale crater as if seen from an aircraft northwest of the crater. This story was updated at 12:45 p.m. EDT. WASHINGTON — It's official: NASA's next Mars rover has a landing site, and it's a giant crater called Gale. NASA's $2.5 billion Mars Science Laboratory (MSL) mission is slated to launch in late November, and will drop a car-size rover named Curiosity at the Gale crater. "We are going to the mountain at Gale crater," Michael Watkins, project engineer for the Mars Science Laboratory at the Jet Propulsion Laboratory (JPL) in Pasadena, Calif., revealed in a press conference today (July 22). "It exhibits three different kinds of environmental settings, perhaps the trilogy of Mars history. It's a worthy goal, a worthy challenge for such a capable rover." "Scientists identified Gale as their top choice to pursue the ambitious goals of this new rover mission," said Jim Green, director for the planetary science division at NASA Headquarters in Washington, in a statement. "The site offers a visually dramatic landscape and also great potential for significant science findings." The agency revealed the landing site today (July 22) in a briefing hosted by the Smithsonian National Air and Space Museum in Washington. The announcement coincides with the museum's celebration of Mars Day, which commemorates the 35th anniversary of NASA's Viking 1 Mars landing on July 20, 1976. Eberswalde is largely considered one of the best deltas on Mars, and at some point, the crater was likely filled with water, Grant said. Each of the candidate sites "represent an incredible opportunity for MSL. It was a very difficult decision to arrive at a final one," he said. "All four of the final sites were really great candidates," Grant told SPACE.com. "Early on in the process, I had a favorite. I can honestly say that that went away. They're really different. With Gale crater, there're still questions about how this mountain of material is in place. All of them have very attractive attributes and some unknowns, so you really have to say, 'Which one offers us the broadest benefits to the objectives of MSL?'" In the end, the program scientists found the broadest benefits in Gale crater's diverse environmental settings. "The Gale site represents an incredibly rich suite of scientific investigations that we can do," said Dawn Sumner, a geologist at the University of California, Davis. By moving toward Gale's mountain, the layering will help scientists understand how the Martian environment changed through time. From these observations, project scientists are hoping to glean information about Mars' potential habitability. The Curiosity rover will expand on previous Mars exploration with its sophisticated onboard instruments. The rover's science payload has the potential to identify organic carbon and other ingredients and compounds that make up the building blocks of biology. Scientists are hoping that Curiosity will find minerals in the clay and sulfate-rich layers near the base of Gale crater's mountain. "Gale gives us attractive possibilities for finding organics, but that is still a long shot," said Michael Meyer, lead scientist for NASA's Mars Exploration Program at NASA Headquarters. "What adds to Gale's appeal is that, organics or not, the site holds a diversity of features and layers for investigating changing environmental conditions, some of which could inform a broader understanding of habitability on ancient Mars." And while Curiosity's mission does not include life detection, the rover is expected to unearth clues about the habitability of the environments on the Red Planet, said John Grotzinger, MSL project scientist at JPL. "This is a very, very difficult challenge that we have for us," Grotzinger said. "We hope to be able to be able to look for organic carbon. What we can promise and deliver with MSL is an understanding of the environmental history of Mars." NASA revealed the landing site today (July 22) in a briefing hosted by the Smithsonian National Air and Space Museum in Washington, D.C. The announcement coincides with the museum's celebration of Mars Day honoring the 35th anniversary of NASA's Viking 1 Mars landing on July 20, 1976.